Are you looking to move into a bigger home? Spaces Storage has all of the items you will need to complete your move. 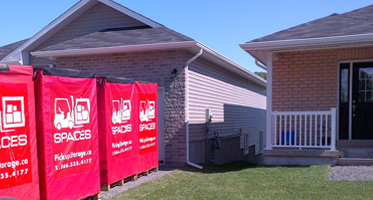 Our portable storage containers make loading and moving as easy as just 1, 2 ,3. Simply give us a call to reserve your storage vault today. We will deliver the vault right to your door. You can pack at your own pace and work around your own schedule. Are you looking to downsize into a smaller home or apartment? Our portable storage containers are perfect for those wanting to downsize their space but keep their precious memorabilia. You can pack all of the items you don’t want or can’t take with you when you move. We will remove the vault when you tell us and hold the container for as long as you want in our secure warehouse. If you ever need to get something out of your vault, just give us a call (48 hours’ notice please) and we can make arrangements to have your vault delivered for you. Expanding Your Office Space or Work Site?? If you are congrats! This usually means your making more money and your business is growing. With a growing business usually comes a need for more space and more people. Spaces portable storage vaults can help you with your move into your bigger space by providing quality storage and moving solutions. Use our portable storage vaults on site while you pack and organize your office items. Then when you’re ready, tell us where to 'move the vault' to and we’re done! Browse our selection of residential and commercial moving services. If by any chance you don’t find what you’re looking for here, simply give us a call at 613-544-7319 or fill out our contact form. We will work with you to develop a solution to your moving or storage problem. Simply give us a call to reserve your storage vault.We will deliver the vault right to your door. You can pack at your own pace and work around your own schedule.